In 1934, only two years after the discovery of the neutron, the existence of neutron stars was proposed by astrophysicists, Baade and Zwicky. They suggested that neutron stars would be about 10km in diameter and would be formed in a supernova. 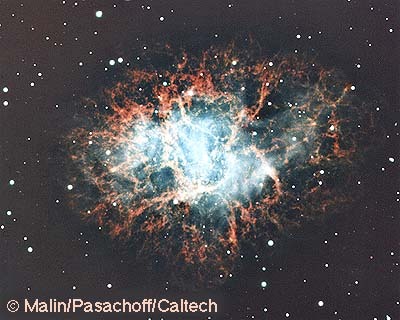 Then, in 1967, Pacini proposed that the Crab Nebula was powered by such a star which was highly magnetised, rotating and emitting electromagnetic radiation. in effect, what we now know to be a pulsar. These theories were later confirmed by Jocelyn Bell, Antony Hewish and colleagues in 1968 when they discovered the first pulsar. At the time they were working on a large radio telescope, observing interplanetary scintillation and they noticed that, aside from the usual scintillation and man-made interference, there was some highly periodic "scruff". Further observation and analysis of this "scruff" showed that the signal kept sidereal time which suggested that it was of extra-terrestrial origin. Several possible explanations were offered, including that the signal was generated by another civilisation, but it is now almost universally agreed that pulsars are rotating neutron stars which appear to pulsate as their radiation beams sweep the earth. Most of the stars in the universe have similar properties to our sun. Typically they are about 1 million km in diameter and fuelled by hydrogen. Because of their extreme temperature, this hydrogen fuel burns to form helium, making them just like a massive hydrogen bomb. After about 10 billion years, a star's hydrogen runs out. 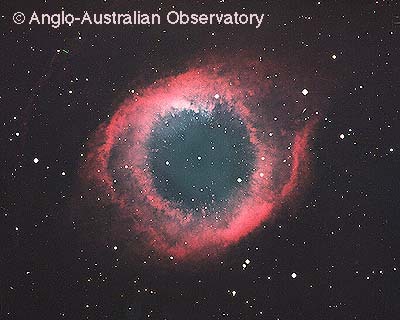 When this happens the star swells to about three hundred times its normal size and gently pushes out its furthest layers to form a glowing ring known as a planetary nebula. The centre of the original star remains intact and becomes a white dwarf, which is a very small, dense star. Initially very hot (about 1 million degrees), it eventually cools down to float relatively inactively throughout the universe. One in every hundred stars are different. These are massive stars and are destined to end their lives in cataclysmic explosions called supernovae. Massive stars are about ten times heavier and four times larger than our sun, they are also incredibly hot, as their hydrogen burns much more furiously. This means that their fuel is consumed at a much greater rate and runs out after approximately 10 million years, which is a relatively short time for a star. Like any other star, massive stars are a balance between heat, which pushes gas up to the surface of the star, and gravity, which pulls everything back toward the centre. When its core runs out of fuel for fusion, the star can no longer create outward pressure to balance the inward gravitational pull of its great mass. this leads its dramatic collapse. The core of the collapsing star shrinks, becoming hotter and denser in the process, as iron atoms are crushed together. During this time the core temperature shoots to above 100 billion degrees. This explosive release of energy results in a huge expanding shock wave and the outer layers of the star are thrown outwards at 1 000 000 000 kph. This giant explosion is known as a supernova. The material which is exploded away from the star slams into surrounding lumps and clouds of gas. It heats up and begins to glow forming an expanding ring known as a supernova remnant. Essentially, pulsars are the collapsed cores of massive stars. They are composed of an iron crust which covers incredibly dense neutron matter. In fact, this matter is so dense that if you brought a piece the size of a sugar cube to the Earth's surface, it would have a mass of 100 million tonnes. Therefore although pulsars are only about 20km across, they weigh more than our sun and are incredibly massive. Pulsars are also have a very strong magnetic field, probably with a dipole form, like a bar magnet. 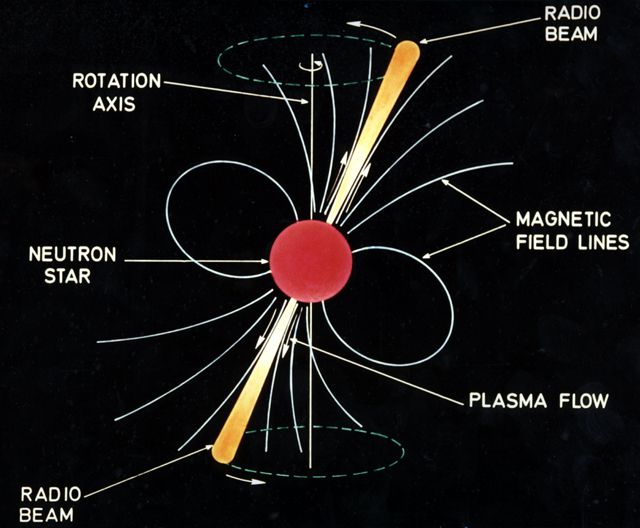 Beams of radiation are formed at the magnetic poles, probably directed radially away from the star. As the pulsar rotates, these beams sweep around 360 degrees like a lighthouse. Radio telescopes receive a regular train of pulses as the beam repeatedly crosses the earth, making the pulsar appear to be a pulsating radio signal. These pulses are broadband, extending in some cases from low radio frequencies to high-energy gamma rays and are often highly polarised. Linear polarisation is usually dominant, with the radiation from some pulsars being almost 100% polarised. In other pulsars, circular polarisation may also be observed but usually with a significantly lower fractional polarisation. Individual pulses vary greatly in intensity. Some of this is intrinsic and some results from scintillation or twinkling due to scattering in the interstellar medium. However, if several hundred pulses are added together, a very stable pulse profile is obtained. Pulsars are also known for their very precise periodicity and make exceptional clocks. There are even some very old pulsars which are believed to keep time more accurately than the best atomic clocks here on Earth. These pulsars are or were members of binary systems, in which, matter accretion from their companion has increased their rotation speed to hundreds of turns per second.Timing observations of some binary systems that consist of a pulsar and another neutron star have been able to confirm Albert Einstein's prediction of gravitational radiation and have allowed sensitive testing of his theory of General Relativity. electromagnetic radiation at the rotation frequency caused by the strong magnetic field. Pulsars exhibit some very rare and extreme characteristics, making them ideal probes for a range of astrophysical studies. Just as biologists hunt for new species to better understand biodiversity, astronomers hunt for new `species' of pulsars to better understand astrodiversity. To gain a better understanding of pulsars and measure the particular parameters of each, new pulsars are profiled over a significant period of time. Many observations must be averaged to produce an accurate characteristic profile. This profile has great stability and a very well defined shape provided that several hundred pulses are summed. The main profiles created are similar to the one on the right and contain an intensity vs. longitude plot, as well as, a polarisation angle position vs longitude plot. Timing is crucial in observing and understanding pulsars. Due to the precise periodicity of pulsars, the expected time of arrival of the next pulse can be determined with great accuracy. By studying the timing residuals, or differences between observed and predicted times of pulse arrival at the telescope, a lot can be learned about the properties of the pulsar. If the residual increases linearly with time, then the assumed period is incorrect. The slope of the residual line gives a much more accurate estimate of the period. If however, the residual curve is parabolic, this indicates that the pulsar is slowing down, and a precise period derivative can be measured. 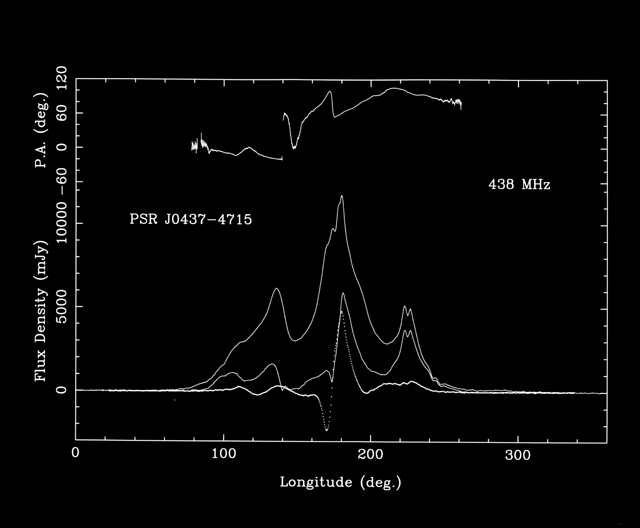 An annual term in the timing residuals allows measurement of an accurate position for the pulsar. Most young pulsars, such as the Crab and Vela, have relatively short periods and high period derivatives, and would be situated in the top right of the plot below. As they age, they move diagonally down towards the group of "normal" pulsars. However, some pulsars, known as millisecond pulsars, have extremely small periods - in the order of milliseconds - and very small period derivatives, these occupy the bottom-left of the plot. Most of these millisecond pulsars are very old and many are found in globular clusters. More than half of them are in binary systems with another star. Compared to the one percent of "normal" pulsars in binary systems, this suggests that they aquire their short period by accretion of matter from their companion star. Study of these pulsars is expanding our current knowledge on the evolution of stars, binary systems and globular clusters. A current search for more pulsars is known as the Parkes Multibeam Survey. It is a high frequency survey of the Galactic plane using a 13-element multibeam receiver on the 64m Parkes telescope. This receiver allows 13 regions of the sky to be simultaneously observed, improving the speed of surveys by the same factor.